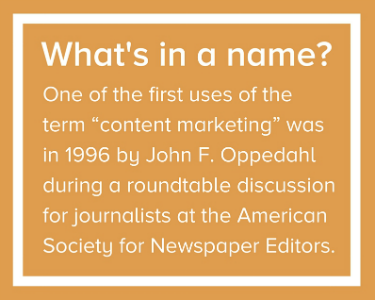 It’s important to know one’s origins, but the history of content marketing is hotly debated. Some experts claim that content marketing started with cave paintings. Others say the first real development came with the invention of the Gutenberg printing press, which catalyzed the creation of pamphlets and other widely circulated marketing materials. Still others contend that content marketing didn’t really come into being until the “democratization” of content through mass communication over the Internet. Some of these theories bear weight. Others might be a bit of a stretch. What’s really important is to understand the ideas and events that define our history as marketers: the major turning points marked by influential brands, campaigns, trends, inventions, innovators, and historical events. And by examining the history of content marketing, we can see that history sometimes repeats itself. We marketers can be better prepared for the future by taking lessons from the past and using them to improve our content strategies going forward. Without further ado, here is the history of content marketing, and the lessons we can learn from it. Tip: Hover the pointer over images to see more content marketing examples! Content marketing practices by brands began to grow in the late 19th century, as technological advances in transportation and communications allowed companies to forge stronger connections with their customers. Brands finally had the opportunity to reach out and form relationships with consumers that were nearly impossible to develop previously. Innovative early marketers seized this opportunity. The pioneers of content marketing pushed forth a new idea — not only could you advertise to customers more easily, but you could strengthen your relationship with them by helping them in their quest for information. Brands focused on the needs and interests of their customers, rather than pushing product purchases. John Deere was one such pioneering brand. Looking to become a resource and authority on methods to improve farming, the company launched The Furrow magazine in 1885. The publication’s purpose was to provide advice and information to farmers looking to improve their businesses and make their properties more profitable. The Furrow didn’t just push advertisements of John Deere products — it provided valuable information and stories for consumers to enjoy. The magazine forged a relationship of trust and dependence between the John Deere brand and its audience through the expert advice the magazine published. The results? The Furrow became a hit. By 1912 it amassed 4 million readers. Today the magazine reaches about 1.5 million readers in 40 countries, published in 12 languages. But John Deere wasn’t alone in this trade publication endeavor. In 1900, the French tire company Michelin developed the Michelin Guide, a 400-page publication offering drivers information on auto maintenance, hotels, and travel advice. Although there were only about 2,200 cars on the roads in France at the time, entrepreneurial brothers André and Edouard Michelin were so confident in the future of automobiles that they distributed 35,000 copies of the first edition for free. The idea behind this marketing tactic was that people would be more likely to travel in their cars with access to the guidebook, wearing out their tires sooner. And, having used the helpful Michelin guidebook, which company did these pioneering marketers bet consumers would choose for purchasing new tires? Michelin, of course! 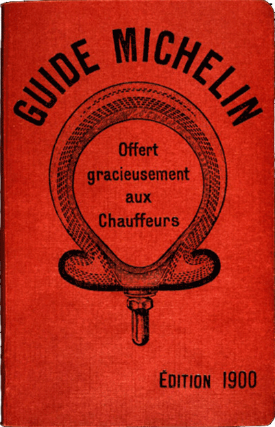 By 1920, Michelin’s marketing foray was so successful that they had created similar guides for other European countries and started charging people for the the publication, creating a new source of revenue for the company. Consumer publications took off, and many specialized their content for specific audiences. Brands took advantage of this segmentation by placing ads in niche magazines. 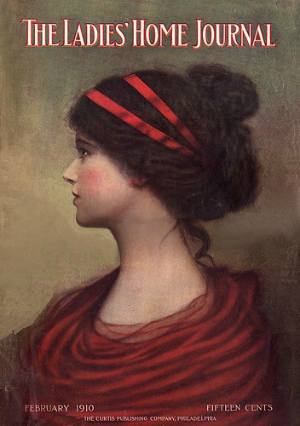 For example, The Ladies’ Home Journal started as a double-page supplement in the Tribune and Farmer, but by 1903, it was its own publication and the first American magazine to reach one million subscribers. The Journal’s articles focused on homemaking tips for women, and its ads centered around home goods, women’s fashion, and other consumer products. One company in particular sought the opportunity to expand its customer base to its target audience by providing valuable content — Jell-O. This realization ushered in a new era in content marketing: audience targeting through niche publications. Orator Francis Woodward, owner of the Genesee Food Company, had a problem. 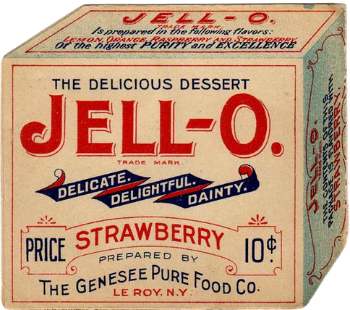 He had purchased the name and business for Jell-O in 1889, but his efforts to make it a popular American dish had failed and sales were extremely slow. Woodward was so frustrated that he had even reportedly attempted to sell it for $35. But thankfully, Woodward decided to change his marketing tactics instead. 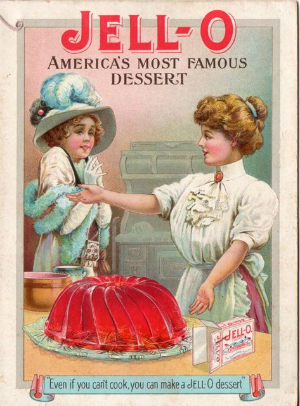 In 1902, Genesee Food Company coined the gelatin dish Jell-O as “America’s Most Favorite Dessert,” placing ads in the Ladies Home Journal that led to a big boost in sales. For Woodward’s company, and many others, The Ladies Home Journal was a prime means by which to reach their target audience — housewives. It’s one old school but powerful example of niche marketing at its finest. In 1904, the company took out a 3-inch ad to launch a novel marketing campaign, and Woodward had salesmen distribute free booklets of “best-seller” recipes for making Jell-O dishes. The campaign was tremendously successful, and by 1906 the company had made almost $1 million in sales and was distributing up to 15 million copies of its cookbook per year. Why did this campaign work? Because Jell-O created content that was appealing and useful to the ideal buyers: the housewife, consumers they approached face-to-face, and readers of The Ladies Home Journal. Jell-O’s fame took off from that point on, and famous artists such as Norman Rockwell, Maxfield Parrish, and Rose O-Neil even created illustrations for the booklets, which helped make Jell-O a household name. But as technological innovation continued to gain momentum in the early 20th century, marketers found new ways to reach potential customers. With the 1920s, technological innovation led to the growing popularity of the radio. Reaching consumers’ ears became a core priority for enterprising marketers. 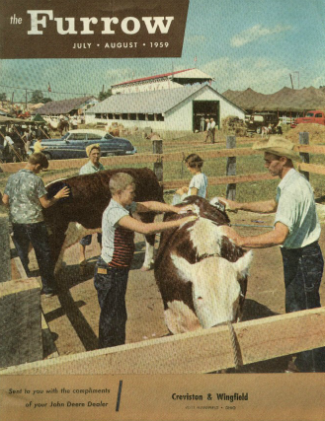 Sears-Roebuck and Company, for example, bought air time to reach out and target the agriculture industry, which promised to be a lucrative relationship. The move was an early example of thought leaderships; Sears-Roebuck provided helpful information to farmers throughout the deflation crisis. From these experiences it became apparent to the company that they needed their own broadcast station. They wanted ownership of the relationship they had started with their farming customers over the airwaves. WLS (World’s largest Store) radio, with content provided by the Sears-Roebuck Agricultural Foundation, went live in 1924, featuring musical and comedic artists, farm and civic programming, and more. 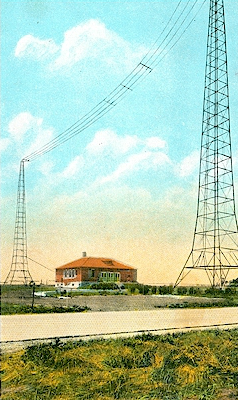 Sears-Roebuck not only advertised their products around the radio show content, but also sold radios so their audiences could tune into the broadcasts. The show was timed to air during the day and was targeted to appeal to women — primarily housewives — who were the ideal buyer demographic. As advertisements during radio show breaks grew in use, these commercials became a precursor for the growing power of advertising, both over the public and in marketing. In the mid-20th century, advertising had grown so much that it monopolized the media. There were few further forays into content marketing, and no very prominent campaigns. Think of this as the era of “Mad Men”…. The line in the sand was drawn — advertising sells products, content marketing sells solutions — and advertising won. With the rise of television in the mid 20th century, companies began to take advantage of the opportunity to create a consistent message about their brand and products across many mediums. Multi-channel campaigns emerged as a result. For example, Exxon developed a catchy call-to-action around their brand logo, a tiger, which they sprayed across many different channels. 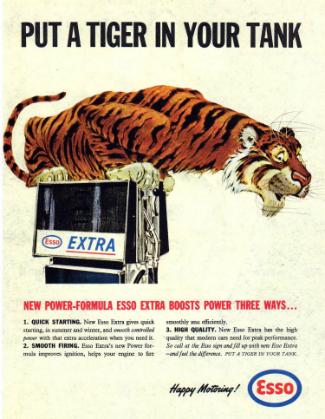 Copywriter Emery Smith developed the slogan, “Put a tiger in your tank,” giving the idea that using gasoline provided by Exxon (Esso at the time) would be like having the strength of tiger to power your car. 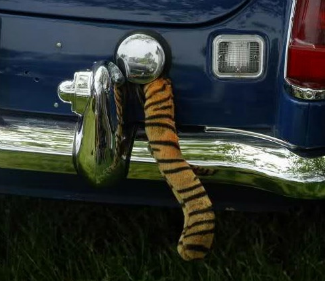 Exxon was able to sell merchandise around the campaign to further promote its brand, such as fake tiger tales that customers attached to their gas tank lids. These tails were so popular that 2.5 million were sold in the United States! The go-to strategy of the era was to broadcast the same campaign across multiple channels. Launching new campaigns was expensive, so brands invested heavily in a single marketing campaign to connect with audiences on a variety of mediums. This turning point is critical the history of content marketing. It set a precedent for using the same message across many different channels, a habit marketers have struggled to buck despite the ease of distribution offered by digital communication. Today, testing new messaging requires minimal investment. Yet many marketers neglect to use leading metrics to optimize their content in real time. Content marketing caught up to the boom in advertising and the beginning of the channel explosion by again concentrating on dovetailing the interests of customers. Because of television advertising laws restricting the amount of animated film associated with a toy commercial, Hasbro decided to take a revolutionary gamble and create a TV commercial solely to promote the comic book, allowing them include a lot more animation. Never before had a company advertised a product through coordinated comic book and television campaigns. 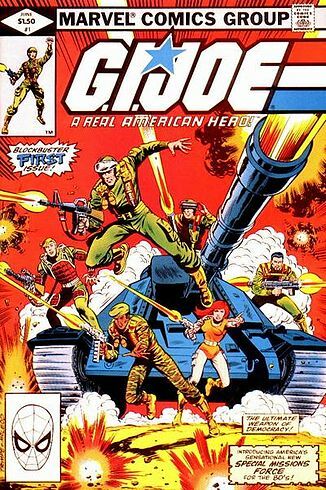 Within two months of the comic book’s first issue, about 20 percent of boys ages 5-12 had two or more G.I. Joe toys. Seven years later two out of three boys of the same age group had at least one G.I. Joe toy, and the comic book was one of Marvel’s best selling series. By inventing a new form of content crossover, Hasbro was able to successfully expand their G.I. Joe franchise and place their products in a majority of American homes in under a decade. In the 1990s, everything changed for marketers. With the popular use of computers and, most significantly, the dot-com bubble, marketers shifted focus from television, print media, and direct mailing to their digital replacements. Websites and blogs proliferated, and companies found content marketing opportunities through email. Hence the email newsletter was born! Ecommerce conversions and digital distribution became the bedrock of marketing strategy. Some experts call this the “democratization” of content marketing, meaning that the open use of the Internet broke the near monopolization advertising had in the media. Now, anyone with an Internet connection can create content and promote it widely (and cheaply). A few key mediums and networks were at the forefront of the digital revolution, and their emergence marked significant turning points in the history of content marketing. 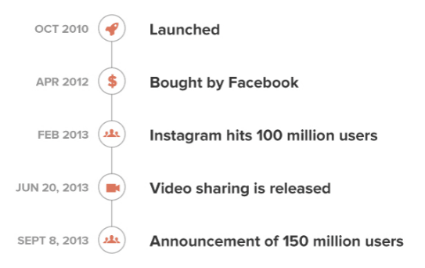 We’re mostly familiar with their foundation stories, but take note of how quickly the digital landscape transformed. The first blog is credited to a Swarthmore College student named Justin Hall, who in 1994 created the site Links.net. However, the term “blog” didn’t enter our lexicon until several years later. The invention of the word was a joint effort between John Barger, who coined the term “weblog” in 1997 as a shortened version of “logging the Web,” and Peter Merholz, who truncated the term to “blog” in 1999. While individuals have used blogs as an online version of a personal diary since the beginning, corporations and media giants alike have adopted the blog as a forum to spread brand awareness and engage and/ or entertain their audience. Blogging quickly became central to content marketing strategy. Why? Blog posts are a sum of content marketing’s parts, often combining the statistics and research of white papers, ebooks, and case studies with the design of an infographic, but with greater length than social media posts and greater personalization than website content. In the 21st century a new medium began to arise — social networks. Channels such as Twitter, Facebook, LinkedIn, YouTube, and Instagram presented new opportunities for brands to engage and entertain new and existing customers. But new channels presented new challenges. Brands struggled to compete against each other, and consumers’ finite capacity to absorb so much content created the necessity for ranking algorithms. Twitter was founded in 2006 by Jack Dorsey, Evan Williams, Biz Stone, and Noah Glass as a social networking platform. Identifying the platform’s marketing and particularly its customer engagement potential, brands quickly got on board the tweet train. By 2011, Twitter had 100 million active users worldwide. Brands shared this success and used it to join and contribute to real-time conversations about their company, products, and associated issues. On February 3 in 2013, Oreo sent a tweet during the Super Bowl that proved the power of real-time messaging on social and became a shining moment in the history of content marketing. It goes like this: The power went out in the stadium during the game, and Oreo’s social media team jumped on the chance to use this opportunity to their advantage. The “dunk in the dark” tweet received over 15,000 retweets and 6,000 favorites, and is a famous example of how a brand was able to capitalize on an event in real time and use it in a marketing ploy. Not all brands have success with content marketing at first. Many brands continued to use the same internal process for producing ads, including a reliance on gut-driven marketing decisions, instead of using real-time data to revise and improve their content marketing strategy. This failure to adapt led to long production timelines and ineffective content for some brands. Traditional marketing processes no longer works in an Internet-oriented world, where timely, data-driven content is the key to success. By the end of 2015, Facebook had 1.59 billion monthly active users on its platform, with more than 50 million businesses pages, and is the channel of choice for business-to-consumer marketers. YouTube was founded in 2005 by ex-PayPal employees Chad Hurley, Steve Chen, and Jawed Karim, and by 2016 had over one billion users. The first viral YouTube video was posted in 2005. It starred John Cleese as “Dr. Harold Twain Weck” in an online video for disk backup company Live Vault. The video, titled ”The Institute for Backup Trauma,” generated unprecedented downloads and online buzz. It generated more than 280,000 downloads after its initial release and created a ground-breaking precedent for the use of videos in content marketing. LinkedIn was launched in 2003 by Reid Hoffman and a team of previous colleagues from PayPal and SocialNet as a social networking platform for career-minded professionals. LinkedIn launched their “company updates” feature in October 2011, opening the floodgates for marketers to communicate directly with employees, customers, and prospects alike. Hewlett-Packard was the first company to have one million LinkedIn users following its page. By the end of 2015, LinkedIn had 414 million users and 8.7 million company pages, and is the most most-widely used channel for business-to-business marketers. Developed and launched in October 2010 by Kevin Systrom and Mike Krieger, Instagram has set itself among the social media titans Twitter and Facebook by being a sharing platform mainly centered around photo and, introduced in 2013, video. The first photo on Instagram was posted on July 16th, 2010 by Kevin Systrom, three months before the app launched in October. Only two years and four months later, in February, 2013, Instagram had over 100 million users. On other channels and platforms, marketers were using the power of modern media to reach an increasingly overwhelmed audience, adding more content to the noise. In China, WeChat launched in January 2011 as a mobile messaging app, but quickly adapted to include capabilities for video media, food delivery, taxi services, payment and ecommerce, and more. Within five years of its launch, WeChat amassed half of the country’s population (650 million) as monthly active users. WeChat’s broad audience adoption and robust in-platform content delivery capabilities laid the groundwork for an unprecedented content marketing event. In 2015, WeChat organically delivered 200 million views of “Under the Dome,” a self-financed, long-form documentary (103 minutes) investigating smog in China, within three days of its release. In this age of fractured attention, where conventional marketing wisdom advises us to keep video content to 90 seconds or fewer, a 103-minute documentary about smog organically reached an audience of 200 million. In fact, WeChat accounted for the lion’s share of views of the documentary, more than traditional news and web sources. Content marketing has seen a huge increase in usage by brands around the world. About 88 percent of B2B companies and 78 percent of B2C companies reported using content marketing in 2015. Experts forecast that content marketing will be a $300 billion industry by 2019. By early 2015, marketers faced a problem. In the rush to “do” content marketing, brands of all shapes and sizes created more content on more and more channels. The result? Many brands wasted their marketing investments churning out content on every new platform that reared its head. 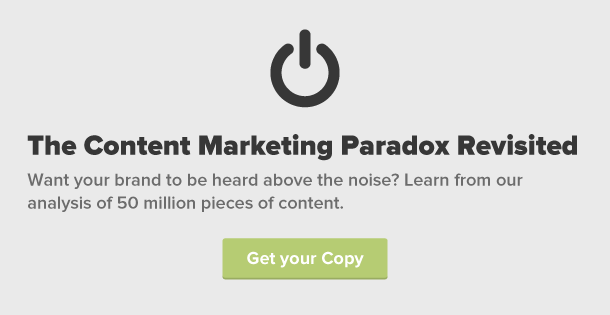 We call this trend the content marketing paradox: creating more content with less return. In 2015 alone, the output of content per brand per channel increased by 35 percent, but engagement fell by 17 percent. These results indicate that we still have much to learn from our own past. If we maintain the status quo of broadcasting low-quality content on every available channel, we run the risk of inciting the demise of content marketing. In the history of content marketing, we can identify patterns and trends that offer valuable lessons for use today. If your brand is just another voice in the feed, prepare to be ignored. 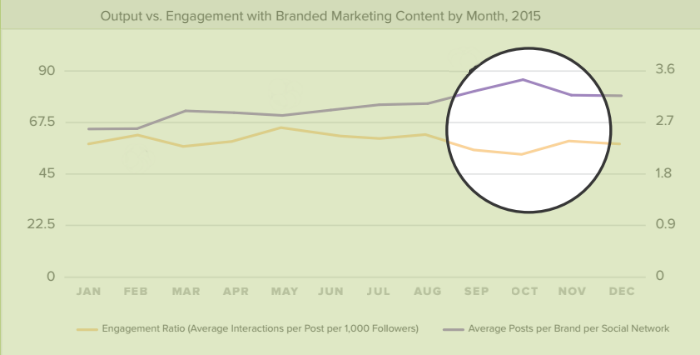 Content competition is getting steeper, and social networks are becoming more sophisticated. To fight the content marketing paradox, you need to focus on quality content that resonates with your audience. Market on fewer channels very well, rather than many channels fairly well. 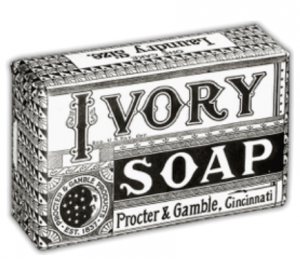 In the early 20th century, audiences listened to branded radio content like Procter & Gamble’s soap operas. Now, we listed to brand-produced podcasts, like General Electric’s The Message. It’s the same idea, just a different method of communication. Look at what has worked in the past (even eight decades ago!) and use those successes as inspiration for future content creation. Know your target audience, which channels they use, and what type of content resonates with them. Both Jell-O and Procter & Gamble effectively targeted women (specifically, housewives) by creating content that would appeal to them in the form of recipe booklets and radio soap operas. They also knew the best way to communicate that content, as advertised in The Ladies Home Journal and by doing radio broadcasts during the day, when many housewives were home. Identify these methods by examining follower behavior on your channels and those of your competitors, and then implement them. Your content strategy has to adapt to the needs of each new channel, stay on top of technological advances, and keep up with changes in content marketing practices. 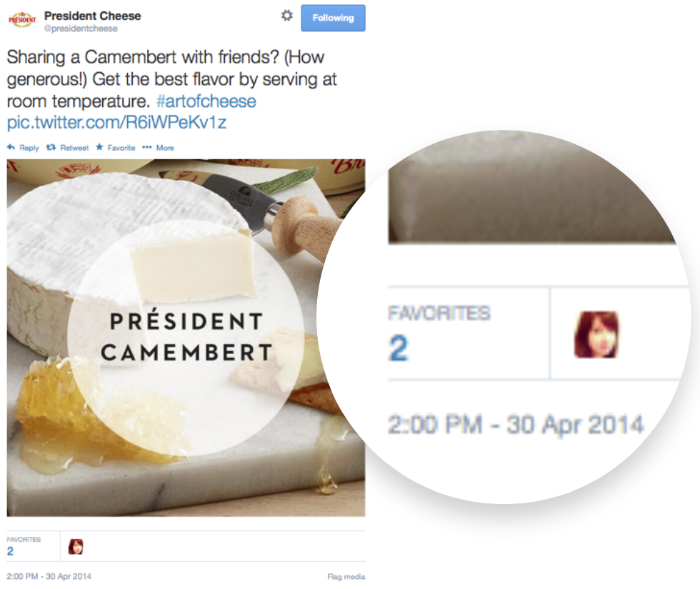 As we saw with our Camembert cheese example, if you don’t continually evaluate the efficiency and effectiveness of your content marketing strategy, you’re likely to fail. From The Furrow, to G.I. Joe, to Oreo — many shining examples from the history of content marketing have some element of risk involved. How did Hasbro know that a TV commercial for a comic book would work? 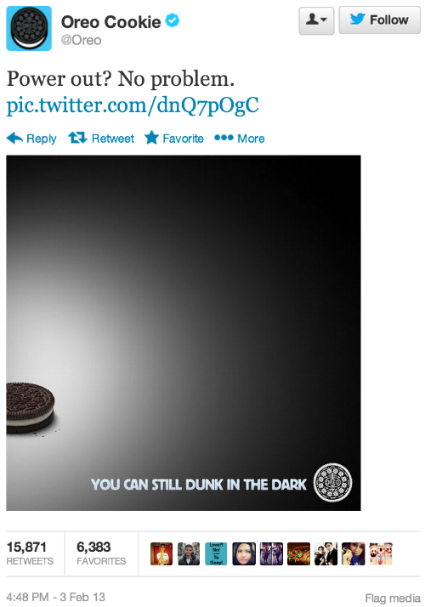 Did Oreo know their “dunk in the dark” tweet would be such a social media coup? And did John Cleese think his YouTube video would go viral? A data-driven approach is essential for creating an effective content marketing strategy, but if you aren’t willing to take chances and try new tactics, you may miss out on a history-making opportunity!